The peer told Peston on Sunday he needed to have a discussion with his partner of 20 years. Peter Mandelson has criticised Jeremy Corbyn for failing to make Labour voters "make up their mind" on Britain's future in the EU referendum. The former EU Commissioner and Blairite minister said Mr Corbyn was "at best muted at lot of the time" and delivered a "mixed message" on his support for Remain which saw voters turn to the campaign led by UKIP. He spoke after two Labour MPs submitted a motion - tabled by Margaret Hodge and seconded by Ann Coffey - of no confidence in their party leader for his performance in the campaign. Lord Mandelson has blasted Labour for failing to have a strategy to decentralise power from London to northern England. The former business secretary accused his party of having "language, not policies" on the issue and described the lack of an alternative to Chancellor George Osborne's "Northern Powerhouse" a "huge political mistake". Peter Mandelson told the BBC's Sunday Politics North West programme, "We were not radical enough in what we were proposing to decentralise and to devolve away from London and to the regions." Lord Mandelson said of Osborne, "He got an idea, whatever his motive was, and he is running with it and we let him do so and that was a huge political mistake. Lord Mandelson said Ed Miliband has "way exceeded my expectations" and hailed the Labour leader's election campaign. The former strategy chief and cabinet minister - who last month declined to positively endorse the party leader - said Miliband had confounded his critics and found the national "Zeitgeist". 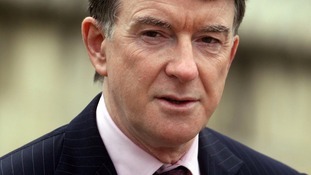 "I started feeling at the end of last week that something had shifted," Mandelson told Channel 4 News. "That the plates had moved and Labour has captured a Zeitgeist in this campaign and the most striking feature of it is what's happened to the two leaders. "Miliband has moved forwards. He gained credibility. He's exceeded most people's expectations. I suppose in a sense mine as well. David Cameron on the other hand has moved backwards." Asked in March whether the party would do better under another leader, the peer had stopped well short of an enthusiastic endorsement of Miliband. 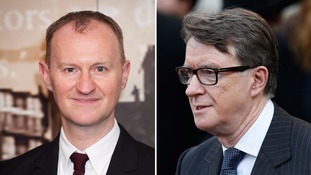 Actor Mark Gatiss has revealed politician Peter Mandelson inspired his performance as Sherlock's brother Mycroft in the hit BBC series. Lord Mandelson said he strongly supported the Labour leader and dismissed claims that he had 'sounded out' a possible replacement. Lord Mandelson has called on the Conservatives to stop grandstanding for the Ukip vote by demanding a referendum on Britain's membership of the European Union. The former European Commissioner and Labour Cabinet minister said the EU needed reform but talk of leaving only created uncertainty for investors and would threaten British jobs. The Labour peer, who was speaking as the European Union (Referendum) Bill reached its second reading in the House of Lords, said he believed it was possible to win the argument for Britain to remain part of the EU if it was put to a public vote. He said: "We need to concentrate on using all of our influence and energy in building up Britain's influence in Europe, not driving Britain out of Europe. "This Bill is not about changing or improving the EU, it is indeed stage one in raising impossible demands on the European Union in order to create the pretext for leaving it." "My message to the Government is stop grandstanding to the Ukip gathering. If you are really serious about European reform, you have to go out and work for it and join with others in achieving it," he added. Lord Mandelson has claimed that Ed Miliband risks accusations of taking the Labour party backwards with his pledge to freeze energy bills. As a result of the speech, I believe that perceptions of Labour policy are in danger of being taken backwards. At the business department I tried to move on from the conventional choice in industrial policy between state control and laissez-faire. The industrial activism I developed showed that intervention in the economy – government doing some of the pump priming of important markets, sectors and technologies – was a sensible approach.